Here's a small preview of how a may run my Logitech Gamepad. button do something different by holding another button down. I'll figure it out as I write the code. The video is pretty bad quality and I shake quiet allot. are controlled by my Logitech Gamepad. planned, Then I can get a upfront view of what R2 sees. will be worth the struggle in the end. This is a huge jump for me and the code I've been working on lately. I have worked the code down to a small package and it works everytime. I'm still working on C# and it is quite a lot to learn. I've been getting help from Indy, Alex and Adren. time after time, I'm still working at it. 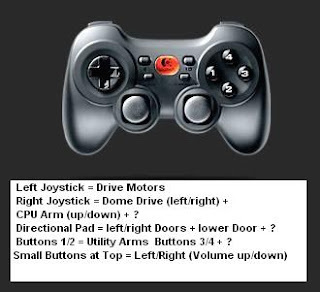 2 servo's with my Gamepad using this code. And it's amazing to see how precise and acurate the setup is working. at 1 time. So it does have some benefits. While studying my Visual Basic, The postman brought my 1st Phidget home. It's pretty small and controls 4 Servos through a computer. servo than the Phidget, I plan to stay with Phidgets. CPU arm and what ever I put in the other door. I'm slowly studying Visual C# and playing around with Microsoft Robotics. I got the M.R. working with my Logitech remote and hope to get more working soon. get the M.R. to control the servos through the Phidget. If all goes well, Hopefully oneday R2 will run on his onboard computer.